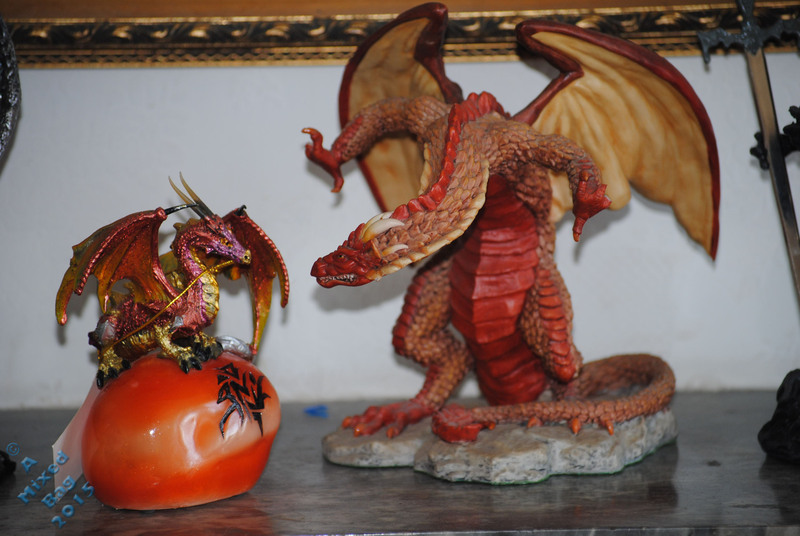 So many things that are red in my house, most of them are dragons. Dragon ornaments, dragon incense holders, dragon pictures, dragon animated kits. I decided to go for one of the oldest of my ornaments. I brought it in 1991 and it was a limited edition then. It would be worth a lot of money had it not been chipped in a move. The little one it is with, is a light dragon. When you turn it on, the light inside the egg glows and dulls. This entry was posted in Photography and tagged Daily Photo Challenge, Dragons, Nikon, Nikon D3000, Ornaments, Peter Sykes Photo Challenge, Photos, September. Bookmark the permalink. dragons are great, getting glimpses of them every so often out of the corner of your eye helps inspire stories I find. I collected dragons (unicorns, faeries, pegasus…). They’ve been packed away for several years now and seeing yours makes me think I should take out one or two. I’ll definitely share, smiles. My collection filled five or six wardrobe boxes, it could be said I had a wee problem with collecting pretty things. I have Danbury, Windstone and Enchantica pieces, some jewellery too.